Gilbert Ryle was one of the most important and yet misunderstood philosophers of the Twentieth Century. Long unavailable, Collected Essays 1929-1968: Collected Papers Volume 2 stands as testament to the astonishing breadth of Ryle’s philosophical concerns. This volume showcases Ryle’s deep interest in the notion of thinking and contains many of his major pieces, including his classic essays ‘Knowing How and Knowing That’, ‘Philosophical Arguments’, ‘Systematically Misleading Expressions’, and ‘A Puzzling Element in the Notion of Thinking’. He ranges over an astonishing number of topics, including feelings, pleasure, sensation, forgetting and concepts and in so doing hones his own philosophical stance, steering a careful path between behaviourism and Cartesianism. Together with the Collected Papers Volume 1 and the new edition of The Concept of Mind, these outstanding essays represent the very best of Ryle’s work. Each volume contains a substantial preface by Julia Tanney, and both are essential reading for any student of twentieth-century philosophies of mind and language. 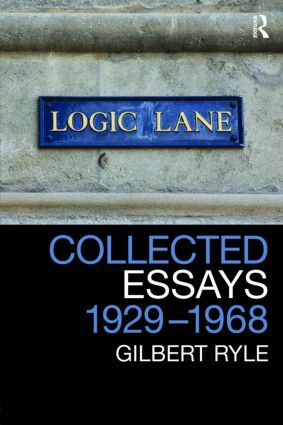 Gilbert Ryle (1900 -1976) was Waynflete Professor of Metaphysics and Fellow of Magdalen College Oxford, an editor of Mind, and a president of the Aristotelian Society. Julia Tanney is Senior Lectuer at the University of Kent, and has held visiting positions at the University of Picardie and Paris-Sorbonne. WHY ARE THE CALCULUSES OF LOGIC AND ARITHMETIC APPLICABLE TO REALITY? The thinking of thoughts: What is ‘le Penseur’ doing?